How will AI change cybersecurity by 2023? Codes are evolving, so are malware. Attacks have become more fluid, more sophisticated as they start with little unnoticeable things and when the jig-saw is put together the attack becomes massive. In a higher than ever connected world security must evolve to stay abreast with current as well as future threats. Machine learning, robots and augmented intelligence are changing the rules of the game, large volumes of data can create a huge difference on how the security system can evolve on its own to keep one step ahead of the sophisticated nature of the cyber-attacks.It speeds up the process of noticing attacks and enables organizations to adopt predictive measures in combating cyber-crimes. 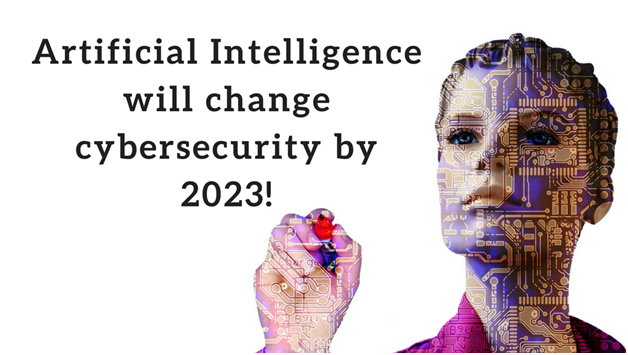 Due to technology, machine learning is gaining traction in the artificial intelligence in cybersecurity market and is projected to cross $6 billion by 2023. There is much larger revenue share of machine learning and it can be attributed to better threat learning algorithm using voluminous data to protect businesses. 55% of the cybercrimes happen in the identity theft and payment card theft. It becomes costly for an organization if preventive steps are not taken in time. AI offers solutions to combat cyber fraud by detecting threats, reducing response time, and refining techniques to distinguish attacks that require immediate attention. Cognitive computing is also gaining high traction in the area of cloud security. AI not only improves current cloud platform incumbency but also empowers the new generation of cloud computing technologies to mitigate security risk. Multiple systems in the area of early warning system mainly will become highly evolved with the use of machine learning. Voluminous data can be fed into the system from around the world and make the technology highly advanced in terms of detecting a threat. Although the exercise in itself is massive it will give companies better security. Be it any industry, AI, and machine learning will become an indispensable part of the CISO strategy as the robustness security will drastically improve. The important aspect to note here is the cost of such a system, if more medium and small business are to be made a part of the security framework, the use-cost must come down. According to P&S market research report– Geographically, Asia-Pacific is expected to witness the fastest growth in artificial intelligence in cybersecurity market, as the region is witnessing rising incidence of cyber-crimes such as identity theft, phishing, and malicious attacks that are growing manifold on yearly basis. Major industries such as banking and financial services, construction and engineering, and healthcare are highly susceptible to threats. The region is an easy target for cybercriminals due to high digital connectivity coupled with low cybersecurity awareness. For instance, According to World Bank estimates, presently 22% of Myanmar’s population enjoys internet access as compared to less than 2% of the population in 2013. Chatbots, machines and natural language processing will change the rules of the game and swiftly embracing the trend will become crucial to cybersecurity.